Imagine undergoing an operation without anesthesia, performed by a surgeon who refuses to sterilize his tools—or even wash his hands. This was the world of medicine when Thomas Dent Mütter began his trailblazing career as a plastic surgeon in Philadelphia during the mid-nineteenth century. 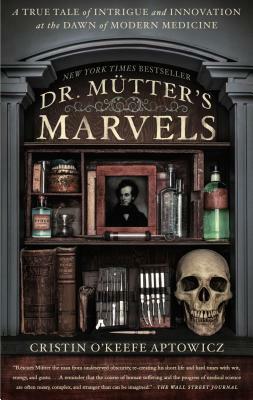 Although he died at just forty-eight, Mütter was an audacious medical innovator who pioneered the use of ether as anesthesia, the sterilization of surgical tools, and a compassion-based vision for helping the severely deformed, which clashed spectacularly with the sentiments of his time. Brilliant, outspoken, and brazenly handsome, Mütter was flamboyant in every aspect of his life. He wore pink silk suits to perform surgery, added an umlaut to his last name just because he could, and amassed an immense collection of medical oddities that would later form the basis of Philadelphia’s renowned Mütter Museum. Cristin O’Keefe Aptowicz is an award-winning writer of Words in Your Face: A Guided Tour Through Twenty Years of the New York City Poetry Slam and popular touring poet and spoken-word performer. She lives in Austin, Texas.